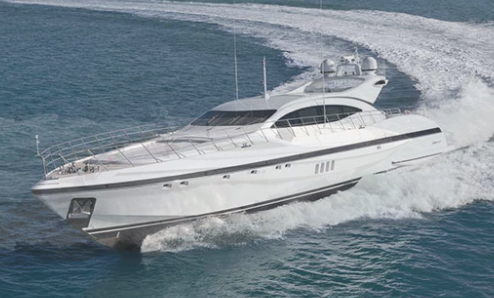 On board the Mangusta 108 you will be able to enjoy the greatest luxury possible on board an exclusive yacht while you travel and enjoy the scenery at sea. There is no navigator to resist this mega yacht for those who wish to enjoy a high-level tour aboard a large ship. Beauty, elegance and a light sporty touch are the hallmark of this beautiful ship. This mega yacht skims the waves of the sea with determination and at the same time lightness, so that you go at a great speed, but hardly feel the blow of the waves. Designed with lines that combine the best of the most classic styles in boats, with very sophisticated finishes, well distributed and spacious spaces, adaptable to different uses, both sports and fun. Suitable for loners or those who sail with relatives or want to make small parties on board this incredible ship. It is extremely spacious, has three double cabins with private bathroom, to offer the greatest comfort to possible companions. It can accommodate up to 8 people. It also has solarium areas and other amenities that make this mega yacht the best option for your vacation. The best of all is that despite its large size, it reaches a high speed, for lovers of high-level tours and all fuses. Despite the great speeds it reaches, it does not sacrifice its stability, unlike other sports.